Wedding reception, Gala dinner, Birthday dinner, cocktail party, corporate event? 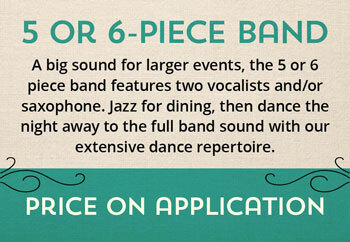 What does it cost to hire a live band? Whether its drinks and dinner or dancing, the right live music can provide the perfect atmosphere and make your event memorable for years to come. Just to give you an idea, here are some prices for our most popular packages. If you don’t see a package that suits your event, please contact us and we will work with you to put together the perfect fit. Perfect for creating atmosphere at cocktail parties, lunch time receptions or during drinks and dinner. 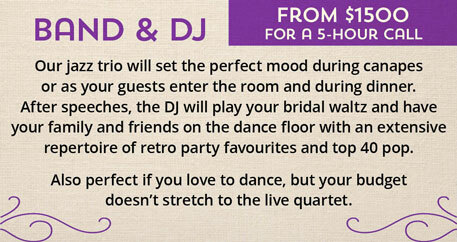 Maybe your venue supplies a DJ, but you’d like something more sophisticated over dinner. In more intimate venues these combos can fit into small spaces and will play from our jazz, bossa nova and light pop repertoire. 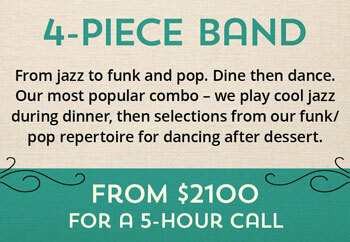 The quartet includes saxophone for that extra jazz touch. 1. Contact Kirsten via phone on 0402 835 035 or email kirsten_allison@hotmail.com to reserve your date and receive a personalised quote and a copy of the booking contract. 2. Sign the booking contract and return it with the deposit. THE KIRSTEN ALLISON JAZZ BAND. ALL RIGHTS RESERVED.